A middle school teacher and first-time political candidate has won the nomination for Nova Scotia’s NDP party in Sackville-Cobequid. The winner, Lara Fawthrop, chose a platform that focused on two policy areas: health care and education. “We need to help our aging population. The health and wellness of our community is at stake … Making sure people can access physical and mental health services will be one of my priorities,” said Fawthrop in an interview. Fawthrop, who has been teaching for 18 years, also wants to put pressure on the Liberal government to improve education. Fawthrop beat Trevor Sanipass, a corrections officer who hoped to become the first Mi’kmaq MLA in Nova Scotia. 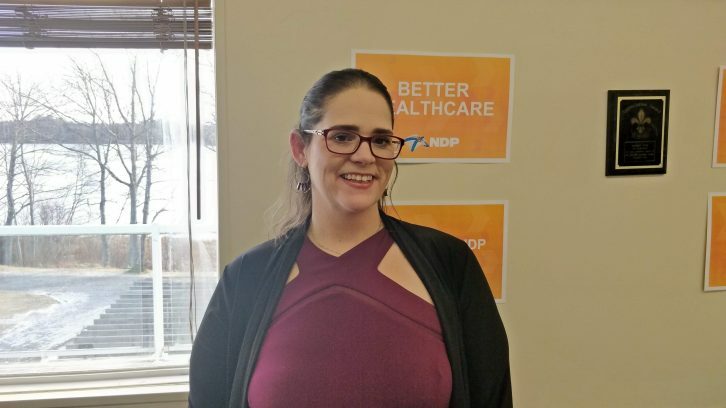 Sanipass won the NDP nomination in the Waverley-Fall River-Beaver Bank electoral district in 2017, but came third in the provincial byelection. The Sackville-Cobequid riding has been held by the NDP since 1984, with John Holm from 1984 to 2003 and David Wilson from 2013 to 2018. Wilson gave up his seat in 2018. NDP party leader Gary Burrill said he expects Fawthrop to follow Holm and Wilson by maintaining the NDP’s presence in the district. The Progressive Conservative Party announced current Halifax Regional Municipality councillor Steve Craig as their nominee for Sackville-Cobequid early last week. Fawthrop will be the first woman to represent Sackville-Cobequid, if she is elected later this year. The Premier has yet to call the provincial byelection, but he must do so by May 16.